US-based electronic e-commerce company Amazon will start delivering packages using drones or unmanned aerial vehicles in India as early as Diwali, The Economic Times reported on Wednesday. With India lacking the rules that govern the use of UAVs, Amazon is likely to start trials of its drone delivery vehicles in Bangalore and Mumbai, cities where the the company has warehouses, people aware of the development told the financial daily. In the US, ecommerce companies are not allowed to operate drones outdoor. 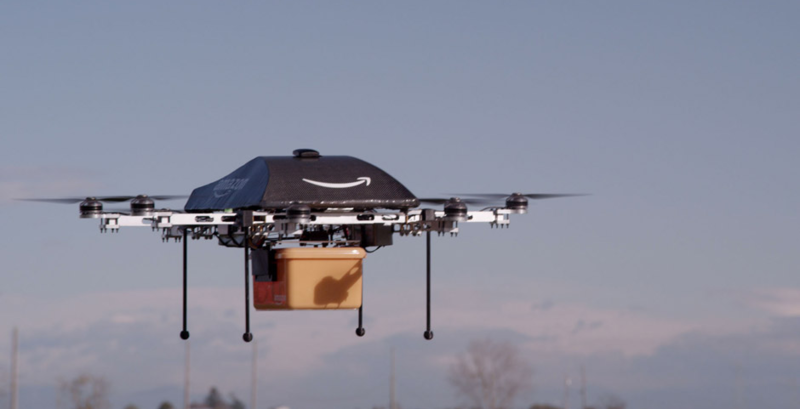 In December last year, Amazon CEO Jeff Bezos said the e-commerce company is testing delivery packages using drones. “It could be as early as Diwali,” said one of the sources. Amazon said in a statement that it does “not comment on what we may or may not do in the future”. Amazon’s Prime Air is an octo copter, a drone fitted with eight rotors. Most recently, Amazon had said it is developing vehicles that weigh less than 25 kg and travel at over 80 kmph. The drone will carry a payload of up to 2.26 kg, which covers 86% of products sold on Amazon. At the moment, Amazon cannot test the drones in the US, as it’s not allowed there. Amazon has already put forth requests with the Federal Aviation Administration (FAA), to be allowed permission to test its delivery drones near Seattle. Currently, only hobbyists and model aircraft enthusiasts are allowed to fly drones outdoors in the US. Flying drones for commercial use is prohibited. According to the norms in India, drones aren’t allowed to be flown at an altitude higher than 400ft and are banned from flying over security establishments. At the moment, all UAV flying is done with permission from Directorate General of Civil Aviation (DGCA) and Ministry of Defence (MoD). Also, for flying remote controlled air crafts, you can only use these frequencies: 27004 KHz, 27116 KHz, 27148 KHz, 27156 KHz and 27228 KHz. At the moment, it looks like an uphill task for Amazon, as far as getting the relevant permissions to start drone delivery in Mumbai and Bangalore by as early as October end. If Amazon is successful with drone deliveries in India, it will be interesting to see how other e-tailers would combat this move. We are already in the middle of the Amazon-Flipkart battle of one-upmanship and drone deliveries will surely take it to another level.